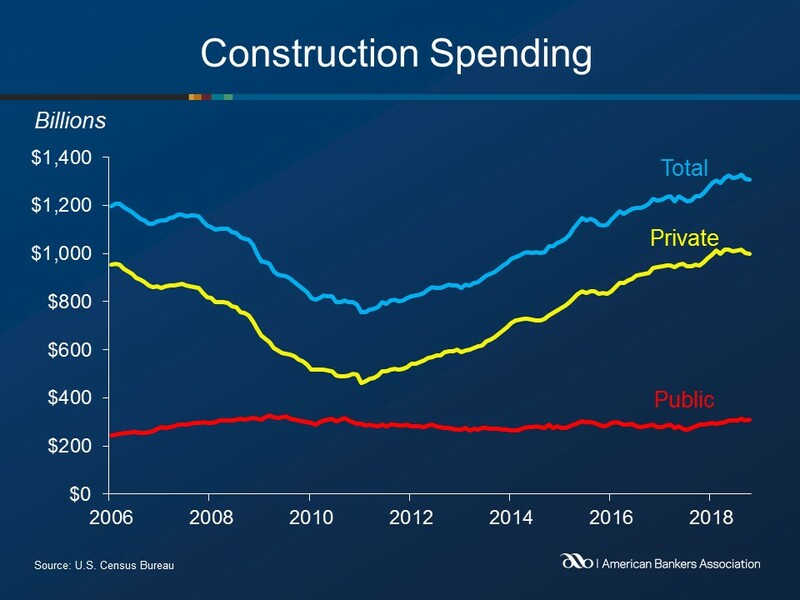 Construction spending decreased 0.1 percent at a seasonally adjusted annual rate (SAAR) of $1,308.8 billion in October, according to the Census Bureau. September’s spending estimate was downwardly revised to $1,310.8 billion. October’s figure is 4.9 percent greater than the October 2017 estimate of $1,247.5 billion. Total private construction was $998.7 billion SAAR, a 0.4 percent decrease from the revised September estimate of $1,003.0 billion. Total private construction is 3.9 percent higher than the October 2017 figure. Private residential construction was $539.0 billion SAAR, 0.5 percent below September’s rate. October’s figure was 1.8 percent greater than its October 2017 estimate. Private nonresidential construction was $459.7 billion SAAR, 0.3 percent below September’s estimate. October’s rate is 6.4 percent greater than the October 2017 figure. Public construction increased 0.8 percent at $310.2 billion SAAR. October’s figure is 8.5 percent above the October 2017 estimate.